Ugadi Greetings with Ugadi Festival Brunch 2012! Ugadi Subhakankshalu! Happy Ugadi to all my readers! I have taken the day off today and finished my pooja by morning. Made the usual neivedyam along with couple of new sweet offerings. It was a brunch for us and planning to visit parents home for the traditional Ugadi feast. Nei Appam with curds to complete the mini meals! 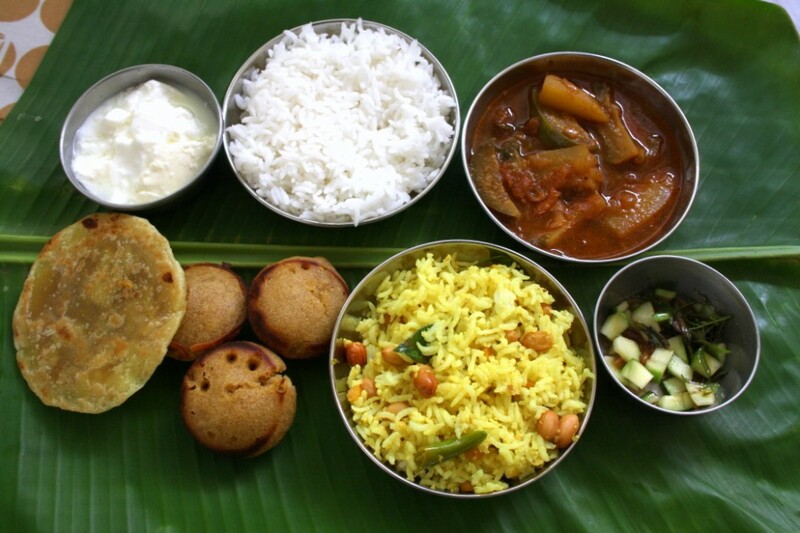 Happy Ugadi………The plater looks delicious. I'm missing this meal being in Kenya…ohhh no!! What a coincidence. I did go to Anjana's blog from the link on your site! I was slightly confused by the comment you left on my post. I was looking for another blog and I chanced upon the site. Delightful posts. And Happy Ugadi to you and your family. Happy Ugadi to you ! Beautiful spread. This is a very unique dish! Will try for sure. Belated Ugadi wishes! Really wonderful post. Covering Whole ugadi but really short. Covering lot of recipe for ugadi. Hmmm those dishes are sooo yummy! Lovely post and my best Ugadi wishes to you and to everyone. Happy Ugadi!